Pastor Johan and Sonja Hinderlie have been portraying Martin and Katy Luther for many years. Created to help commemorate the 500th Anniversary of the Reformation, this short film shares the 95 Theses Story before it happens. 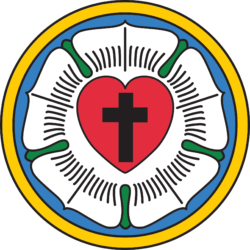 Inspired by the original article “What Drove Luther’s Hammer” by the Rev. Dr. Rod Rosenbladt – please connect to the project and other resources from the 1517 – The Legacy Project here: 1517Legacy.com.